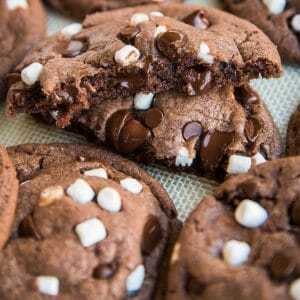 Delicious and easy Crispy Chocolate Cookies are sure to hit the spot. While I usually crave soft and chewy chocolate chip cookies, sometimes you just need a crispy chocolate chip cookie instead. Rich, buttery and delicious, this Crispy Chocolate Chip Cookie recipe is always a hit with my family. 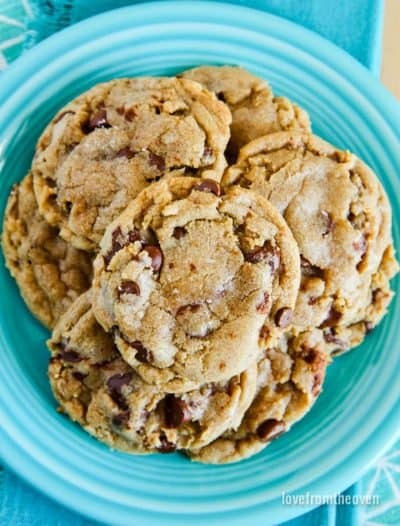 I think one of the things I love most about crispy chocolate chip cookies is the rich, caramel like flavor they have. These cookies absolutely deliver on that. I also kick up the salt in these, and top with some flakey sea salt. That is optional, but if you love a good salty sweet combo, I high suggest it. 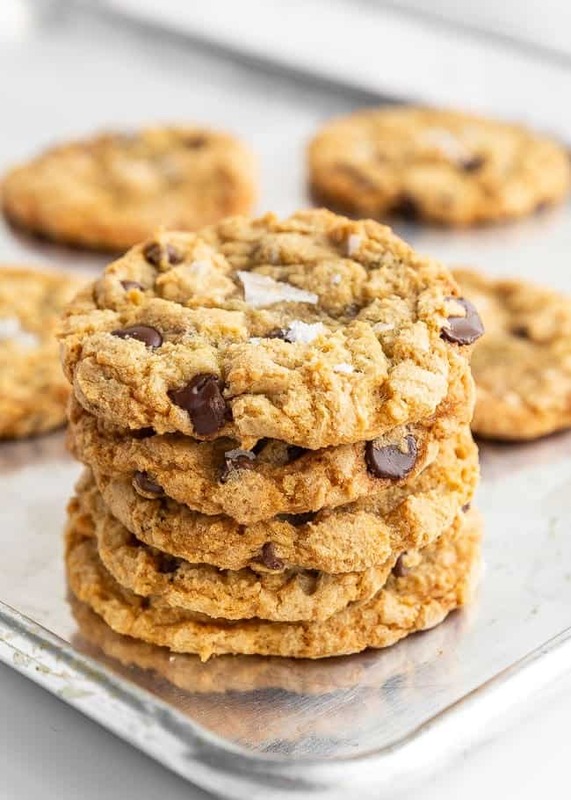 While a fairly basic cookie recipe, you do have a few different ingredients in these than in your standard Nestle Toll House chocolate chip cookie recipe. 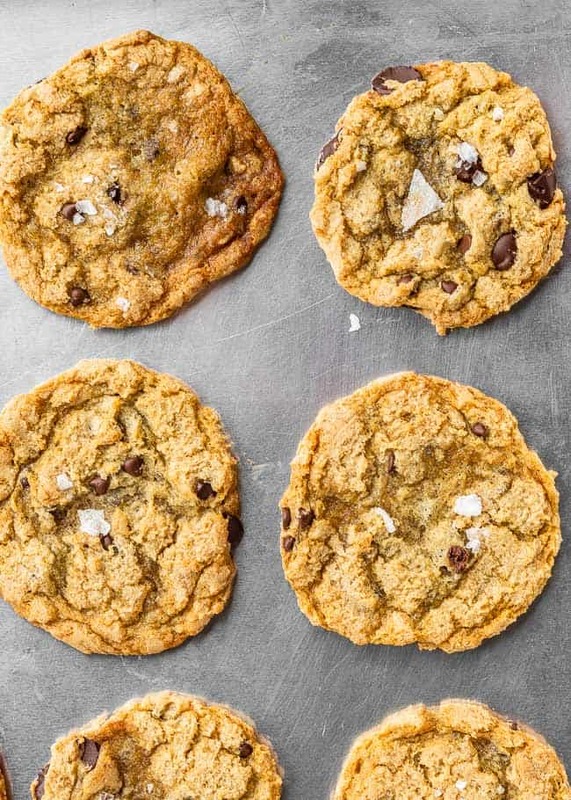 Take note that you’ll need milk and maple syrup to make these Crispy Chocolate Chip Cookies. While I usually always use silicone baking mats when making cookies, with these, I do not. 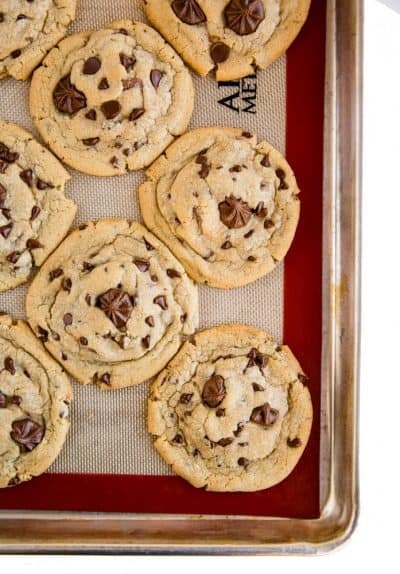 For this Crispy Chocolate Chip Cookie Recipe I just use parchment paper on my cookie sheets. To clarify you don’t see that in the photos, but that’s just for photo sake. While I used both mini chocolate chips and regular semi-sweet chips in these, I didn’t overload these with chocolate chips. My tastes have changed over the years. At this point I really want to taste the cookie, with the chocolate being a little accent. However if you want more chocolate, go for it! I do like a semi-sweet or dark chocolate chip for these, compared to milk chocolate. That said, I never prefer milk chocolate, so your mileage may vary based on preference. These go from the baking sheet to a wire cooling rack. While they have a nice crispy, crunchy edge, the centers still maintain a chewiness. These are a flat and thin chocolate chip cookie, as one would expect for a crispy chocolate chip cookie. 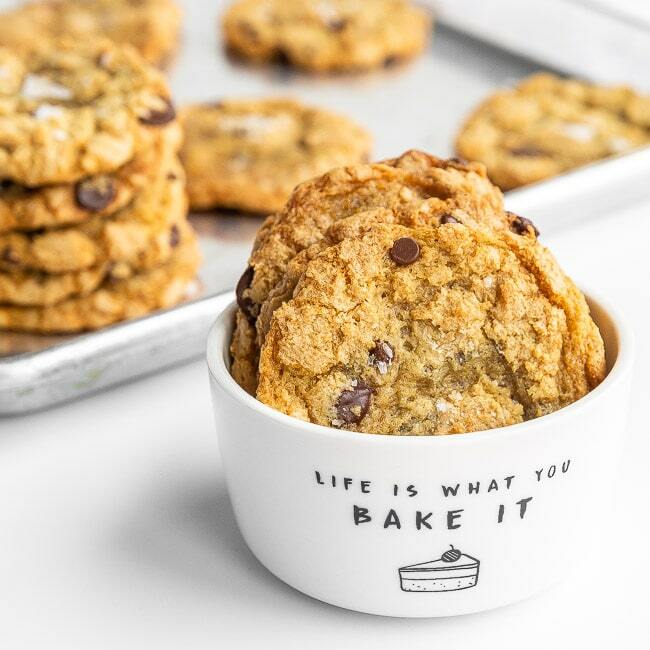 One of the things I love about these Crispy Chocolate Chip Cookies is there is no dough chilling required. Turn on the oven, whip up your dough, and you’re eating cookies in under an hour. I have found that if you store these in a tightly covered container (think a sealed Tupperware container) they do soften up a bit overnight. They are just as delicious, they just lose a bit of the crunch. Just an FYI for you. 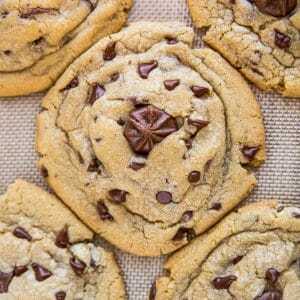 These rich and delicious Crispy Chocolate Chip Cookies are quick and easy to make. No dough chilling or complicated ingredients, just a quick and delicious Crispy Chocolate Chip Cookie Recipe. Prepare two baking sheets with parchment paper and set aside. 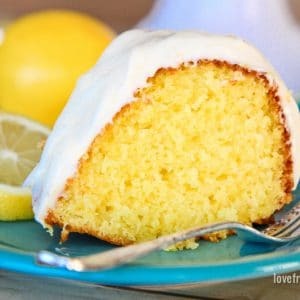 In a medium size bowl, combine flour, salt, and baking soda. Mix well and set aside. 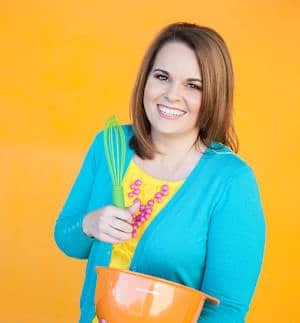 Add yolk, milk, and vanilla to mixture and mix until throughly combined, approximately 1-2 minutes. Add 1/2 of flour mixture to ingredients and mix on low until just starting to combine. Add remaining flour mixture and mix until just combined. Do not overbeat. You want to limit the amount of air you work into this dough. 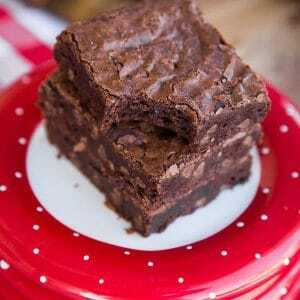 Fold in chocolate chips and mix until just combined. Leaving about 2 inches between each cookie, scoop and place dough onto baking sheet, approximately one tablespoon for each cookie. If desired, sprinkle the top of each cookie with a few flakes of sea salt just prior to baking. Baking only one sheet at a time, bake for approximately 12 minutes or until cookies are starting to brown and turn golden. Remove from oven and cool cookies on baking sheet 3 minutes. Using wide, thin spatula, transfer cookies to wire rack and let sit until crisped and cooled to room temperature. * Nutrition information is estimated as a courtesy. If using for medical purposes, please verify information using your own nutritional calculator. Percent Daily Values are based on a 2000 calorie diet. 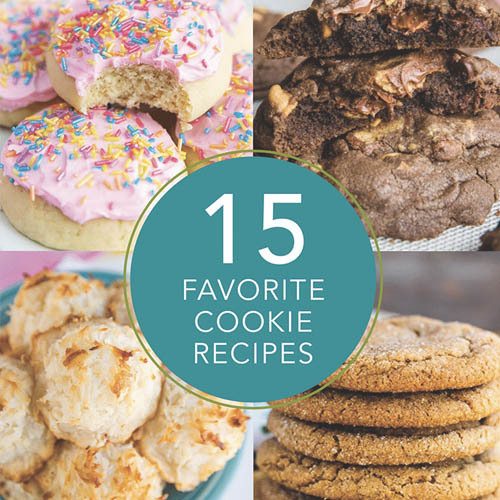 I’ve got more delicious chocolate chip cookie recipes for you! 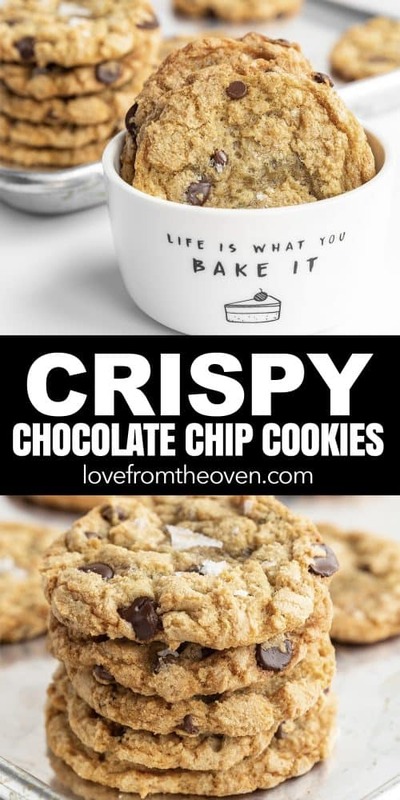 Want a CHEWY CHOCOLATE CHIP COOKIE? 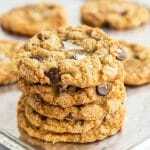 I’ve got a great chewy chocolate chip cookie recipe for you! 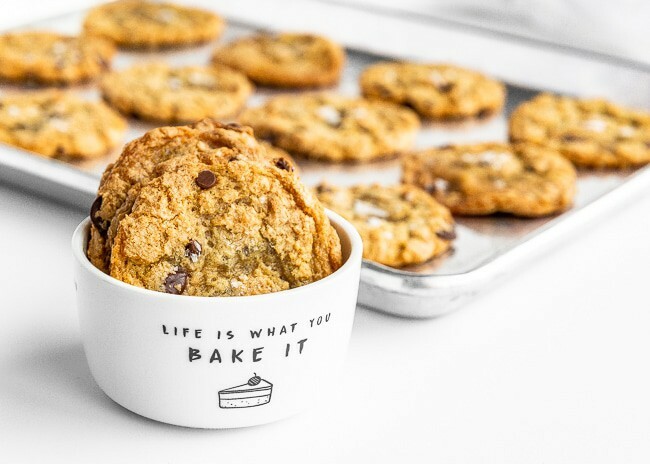 If you’ve got some time, these BROWN BUTTER CHOCOLATE CHIP COOKIES are absolutely drool worthy. 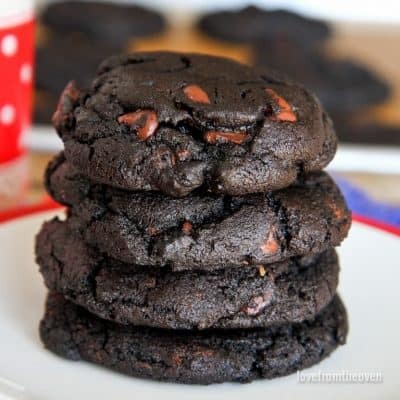 For a severe chocolate craving, take two Chocolate Chocolate Chip Cookies and thank me in the morning. 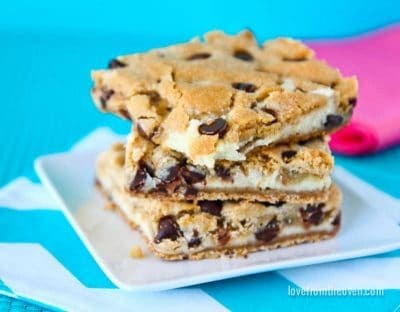 If you are a cheesecake fan, these Chocolate Chip Cookie Cheesecake Bars are not to be missed. 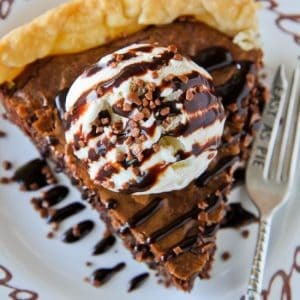 This Chocolate Chip Cookie Pie was one of the first recipes I posted here on Love From The Oven. It’s still a favorite! 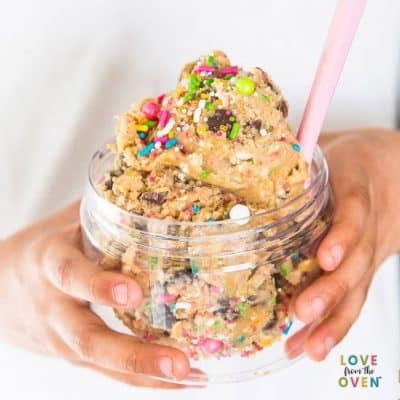 Thinking you could just eat cookie dough and not even make cookies? I hear you, trust me, I hear you. And that’s why I’ve got and Edible Cookie Dough recipe for you. It’s a reader favorite! 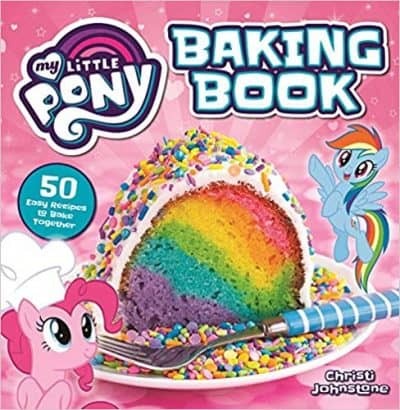 My friends also have some great recipes to try. Aimee at Shugary Sweets has a great recipe for Chocolate Chip Cookie Cheesecake Parfaits that are great to serve when friends or family come over for dinner. 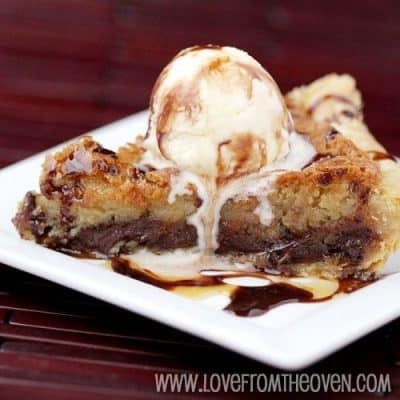 The Brown Butter Pecan Chocolate Chip Cookie Bars recipe at She Wears Many Hats is simply not to be missed. 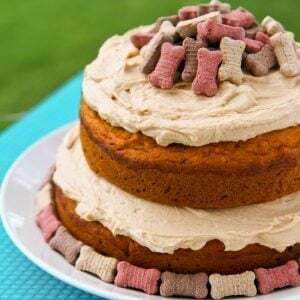 And the Ultimate Chocolate Chip Cookie Layer Cake from Life, Love and Sugar is what I want someone to make for MY birthday!